High Priest’s Grave – a smaller version of the “Castillo” served as a tomb for one of the city’s rulers. Nearby are the Caves of Balankanche, where a large selection of ancient pottery and idols may be seen still in the positions where they were left in Pre-Columbian times. 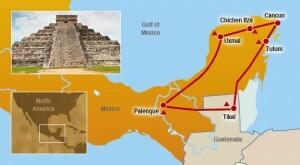 By road – Chichen Itza is on the main highway between the capital city of Mérida and the resort city of Cancun. If you have time and are looking for a more adventurist route, the “libre’ road that runs parallel to the toll highway goes through and by many villages and gives a better feel for the area. If you take the “libre” route, you will need to be more alert for pedestrians and animals on the road, as well as the numerous “speed bumps” you will encounter. If after dark, stick to the toll road. Come by automobile or take the very regular bus service. 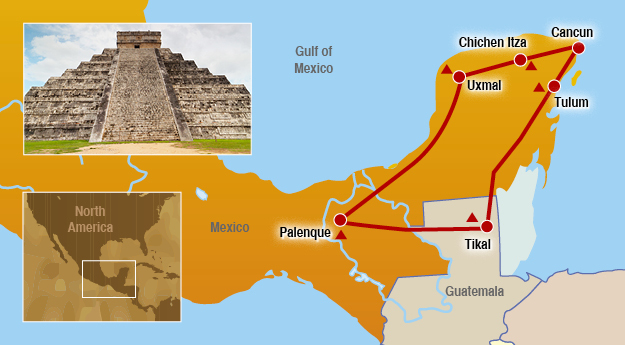 ADO bus services from Cancun costs between 117 -180 pesos one way trip and the trip takes three to four hours. You’ll have about 4 hours to spend on the area. Accomodations – There are a handful of hotels by the ruins, along the highway nearby, and in the nearby town of Piste, in a variety of price ranges. The town of Valladolid, 40 km away, is a less-touristed alternate base.